This is a quick look at the iPad 4 – Wifi version only, with the touch digitizer off the iPad 4. Almost identical to the iPad 3, and iPad 2. 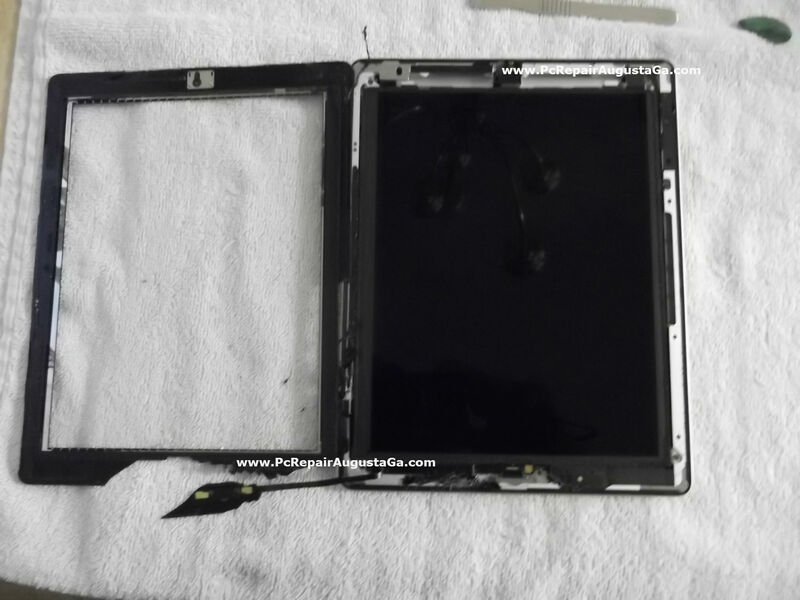 The iPad 3 and iPad 4 both have a small protection plate fastened by very small screws that protect the on/off, volume, mute ribbon cable. The protection plate or small cover is in the upper right corner of iPad as if your holding iPad with home button in front of you. Near the volume and mute switches. On the iPad 2 a very small portion of this power ribbon cable is partially exposed and if your not careful you can rip or snap this cable in half. Heat, and prying the panel upwards carefully, slowly and taking a look under can usually get you by this area. You need to know what the power ribbon cable looks like, and where it is exactly exposed in order to leave this cable in one piece. The on/off cable is not expensive at all, but a real pain to replace. Very small cable, extremely small screws and very tight area to get your fingers and hands into. But as stated the iPad 3 & 4 this cable is protected. You will also notice in this photo to the upper right, one major difference is the iPad 4’s home button, it is connected by ribbon cable to logic board. 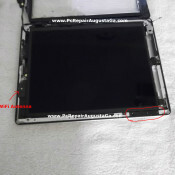 Adhesive bound still to back of the digitizer as the iPad 2 & 3 but it’s connection is by a very small ribbon cable. Ipad 4 home button cable connects down and under in the left hand corner. 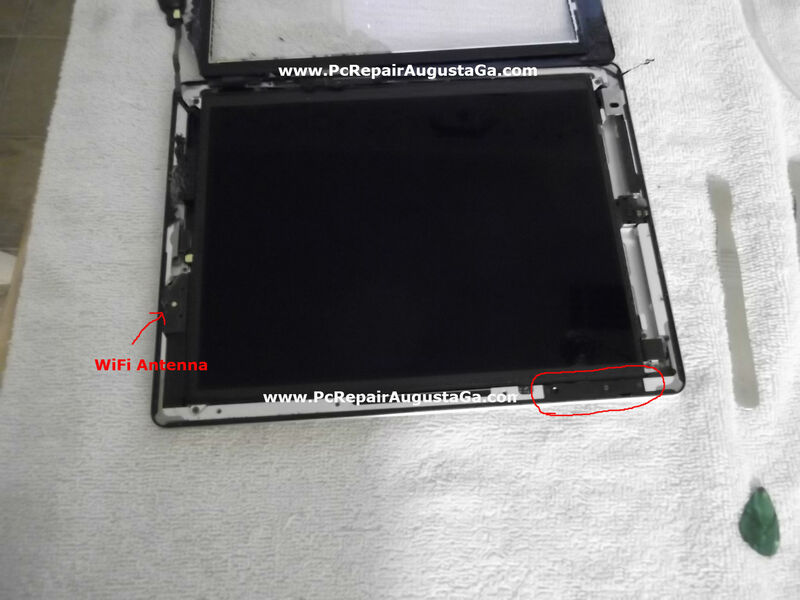 When lifting or folding up the digitizer off the iPad, from right to left, and you cleared the wifi antenna take a peak under and watch for that home button ribbon cable. On the left side of home button. 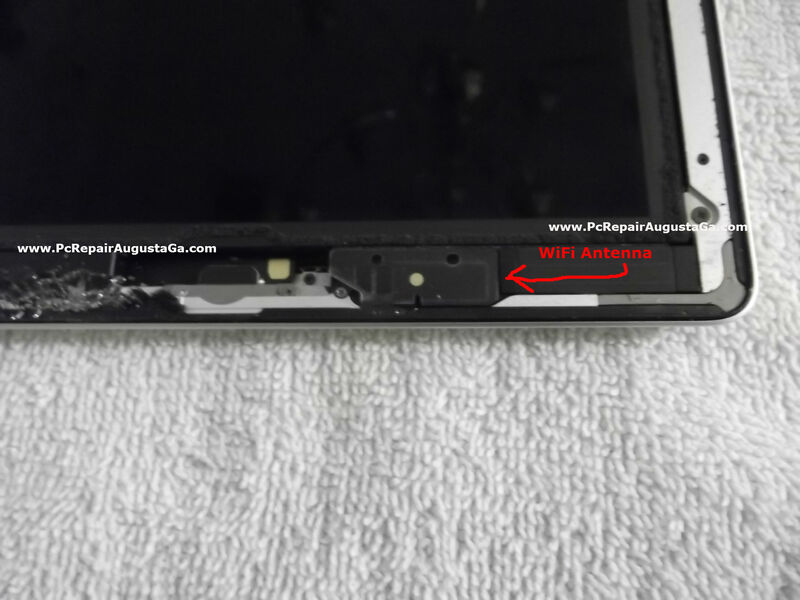 The red circle in photo to the left is the protection cover, that covers the on/off, volume, mute ribbon cable on the iPad 4 , same as the iPad 3. 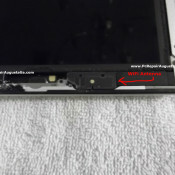 The iPad 4 wifi antenna is to the right of the iPad’s home button. Same wifi antenna location on the iPad 2, 3 and 4. Photo to the right is the iPad 4’s wifi antenna. Wifi antenna, lower right corner area, just to the right side of the home button. This wifi antenna is fasten to the backside side of digitizer by adhesive tape. There are also 4 very, very small screws that mount the wifi antenna to the iPads frame. DO NOT run or slide your “spudger” tool, pry open tool through this area if you do not want to cut through this antenna! To get by, or free this wifi antenna up, HEAT is the key! About 20 seconds of good heat, using a heat gun in the right hand corner over to the home button, keep heat gun moving around. After applying heat, slowly and carefully start in that right hand corner and pry up SLOWLY, re-apply heat, pry up SLOWLY. Better yet, if you can break the glass up in this area, starting at the right hand corner (if your digitizer is already broken) and pull out small pieces bit by bit. Start looking for the wifi antenna. What I’m looking for is the backing or film of the antenna. Heat, and pry up about 1/4 of an inch in that right hand corner, and take a look under this area. You need to know exactly where this antenna is located, and what it looks like. You can rip out this antenna very easily. If you rip this antenna in any way, even from the screws mounts that fasten it to the frame, best to replace it before sealing new digitizer down. And best to check the power on, the touch digitizer, AND the wifi signal BEFORE sealing a new digitizer down. I haven’t had to detach the home button ribbon cable from the logic board. It is a very small ribbon cable and connector. Looks like it would be very troublesome to get to and re-connect to board. In the photo to the left, in the upper left hand corner of the iPad (in photo) you can see the home button ribbon cable. How it has folded, or lifted upwards with the digitizer as I opened it up completely. The home button assembly itself, I heat and take off old digitizer and fastened with adhesive to new digitizer. The cable will reach as you do this with the ipad base right next to the digitizer. The home button assembly broke off the digitizer glass completely (1st photo at top of this page) on this one, just had to remove the small glass pieces off the home button assembly. The iPad 4 & iPad 3 use the same digitizer. The digitizers ribbon cable and connector are the same, and same location on both iPads. 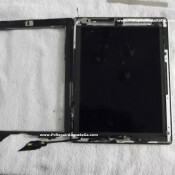 The only difference is the home button assembly is connected to logic board via ribbon cable on the iPad 4, the iPad 3 it is not connected by ribbon cable. If the home button is not damaged, just transfer the home button assembly with ribbon cable onto the new digitizer panel. If you are changing out the digitizer. This is a guide is a quick look at what is under the digitizer. And by no means does Lightspeeds Computer Repair take any responsibility in the dis-assembly of your equipment by this guide & photos, and you damaging the equipment. Dis-assemble, re-assemble at your own risk. I have probably changed out 100 iPad digitizers just in the last 2 months. And each one I receive and do, I dread it, hate it completely. You can cut your hands up easily on removal, goggles are needed also to protect your eyes from glass fragments that explode off the shattered digitizer at times. 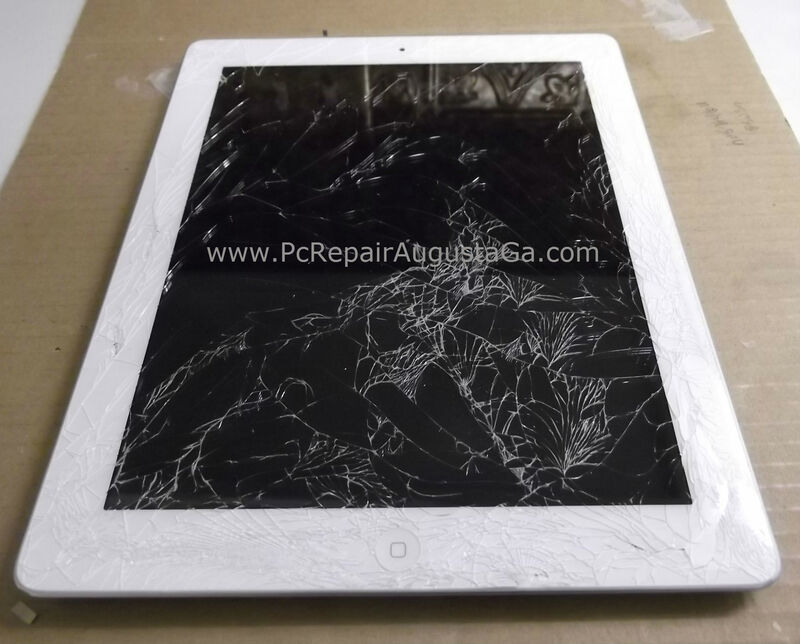 I’ll take a laptop tear down anyday over a and iPad digitizer replacement. I’m frankly quite shocked at the amount of iPad cracked screens I am receiving just here locally. 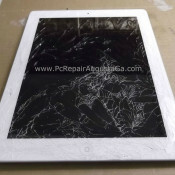 That high priced Apple iPad has a extremely high damage risk due to the mobility. The slightest drop impact will crack & shatter that touch panel so easily. I personally would never own an iPad based on what I see coming to me for repair. 10-15 LOCAL calls per day, everyday.